Over the years I have seen detox foot pads that claim they will help you lose weight. Some of them have ingredients like grapefruit pectin, which is known to help those pounds get flushed away. I have been selling Purify Your Body detox foot pads for over 7 years, and have been using them for almost 9 years. (Not continuously... I normally use them only on weekends as maintenance). I have studied, and found the best formula using the best ingredients, and of course, using absolutely no fillers. As a result, Purify Your Body offers the best deal on the best foot pads, and as always, we offer free priority mail shipping anywhere in the U.S. So, I hope that I come to you with a little bit of knowledge on this subject. 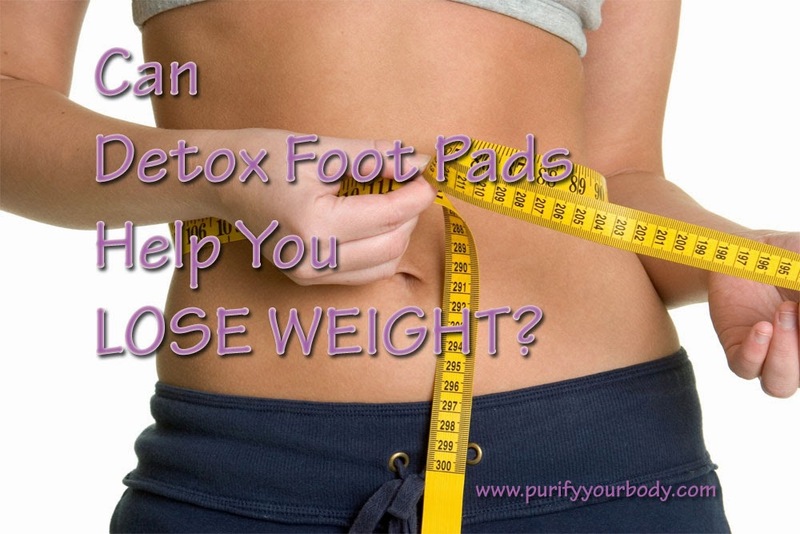 Detox foot pads WILL help you lose weight. But not in the way you are thinking. You don't need special ingredients (like grapefruit pectin). None of the ingredients ENTER your bloodstream. (It can be debated that minute amounts do get into your body... and that might be true, just as your skin might absorb lotion, however, the ingredients of the foot pads PULL things out, and so let's say that nothing in adequate amounts to help you lose weight, will enter your body through the foot pads). With most people who are struggling with their weight, we see a problem of a sluggish metabolism. When your body is filled with toxins, your thyroid isn't going to work to regulate your metabolic system. It will become almost stagnate. As a result, no matter what you do, no matter how many calories you burn, no matter how few calories you eat, YOU WILL NOT LOSE WEIGHT! At least not easily. It will be very difficult for you to lose weight and it will cause a vast amount of frustration as a result. Like walking on a treadmill, you won't get anywhere no matter the effort you put in. So, where do the detox foot pads come in? Simple. You cleanse your body -- especially use them on your toes -- and get your system cleaned out, so when you DO workout, when you DO eat right, your body will reward you by losing the fat. Like a well tuned machine, your body will finally respond to all your weight loss activities. But, if you continue to put toxins in your body (i.e. via the foods you eat and the toxic drinks you consume), you will face the same situation over and over again throughout your life. Some of the worst culprits include diet beverages that contain aspartame and sucrolose (splenda). This horrible poison is so bad for anyone who wants to lose weight. It will make your metabolism slow down so that it is at a standstill. It can cause brain lesions, migraines, epilepsy, and more. It can make you feel fatigued. And it is in so many processed foods, including yogurts! Commercial yogurt is NOT a health food. Don't be misled. IF you want a good probiotic, try kefir. In fact, try making your own. I would suggest starting out with a 60-day supply of the detox foot pads. Wear them every night, rotate the area on your feet where you put them on. Then, at the end of the month, consider how you are feeling, and decide if you want to continue. You will know whether they will be worth it to you.